There are many kinds of businesses that rely on commercial vehicles in their work. From pizza delivery to satellite vans, commercial vehicles are an important part of many organizations’ routine. 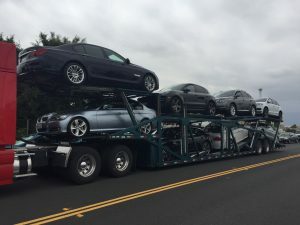 That is why it is critical to find a reliable car transporter when you need commercial auto transport. Auto shipping should fit into your business schedule and be done by a professional team. You cannot afford any delays and interruptions in your business. You need a trustworthy auto shipper that will provide you with the high-quality services you require. Baltimore Car Transport is here for you to assist with all your vehicle shipping needs. We can ship any kind of truck to or from Baltimore, MD. Be it a big rig or box truck, we will deliver it door-to-door safely and fast. We also ship all types of commercial vans, including cargo vans, passenger vans, step vans and sprinter vans. Our team can organize transportation of a single van or several vans at the same time. We ship cars of all makes and models, in any condition. You can choose between open and enclosed auto shipping. With our company, your vehicle will be in safe hands during the entire transit. Ship any kind of bus to or from Baltimore, MD at the best price! At Baltimore Car Transport we always have the best offers for any type of vehicle transport. Get a free quote from us today! We will be happy to ship for you.